I thought today, we’d look at a simple error message that might crop during your implementations. I’ve been neglecting the blog for a month or so, and I need something simple to get me back in gear. So, here goes. Sometimes, when you run action scripts, you might run into the following error, “Insufficient rights to update property”. Let’s take a look at why this happens, and a possible resolution. The property in question, is a simple local property. The property contains a list of some of my favorite breweries. The hierarchy is pretty simple, as well, with a list of beers grouped by region. I tried to use the following action script to set the “Unlk_Inh” property to “Russian River”. Theoretically, that should do it, but the script errors out. I happen to be an administrator, but I still run into this issue. Plus, there is no security set on this hierarchy. So why does this happen? The answer lies in the property itself. If we look at the property for the node in question, we see that the property itself is locked, with the value “Alpine”. If we move our mouse over the status area of the property, we can see a message that the property value has been inherited from a parent above. If we now select that parent node, we can see that the property has been locked at this level. This means that all of the nodes below must use the property value, as set by the parent. 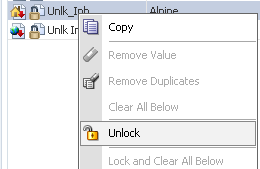 The fix is pretty simple, all you have to do, is unlock the parent property value, by right clicking and selecting “Unlock”. If you now re-run the script, it should complete without issue. And there it is, a quick post on how locked properties may result in unintended consequences. More importantly, Cheers, until next time. BTW, I highly recommend Pliny the Younger, if you can get your hands on it. action script, DRM, error, inheritance. Bookmark.